Sony BMG today became the second major label to sign up to Nokia’s ‘Comes With Music’ service, whereby customers who buy a supported handset will get a year of unlimited access to “millions of tracks”. When Nokia first unveiled its all-you-can-eat music offering last December, Universal Music was the sole partner, a natural fit considering that the label has been busy touting its own flat-rate plan known as Total Music. However, the two remaining majors, EMI and Times Warner, have yet to commit to Nokia’s scheme. The way ‘Comes With Music’ will work is as follows: Consumers who buy a supported Nokia device will have a year of access to Universal Music and Sony BMG’s music catalog, whereby they’ll be able to download tracks to both their mobile handset and Windows PC through the Nokia Music Store. After the year is up, they get to keep any downloaded tracks. 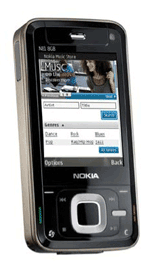 To continue accessing new music, however, users are given “a number of attractive options” — aside from purchasing a new ‘Comes With Music’ device and starting another 12 month cycle, they can purchase tracks (download to-own) from the Nokia Music Store, or move on to a Nokia “unlimited access” subscription plan a la Rhapsody. One potential issue, as noted by mocoNews, is the recent trend towards 18 month carrier contracts. According to the press release: “Comes With Music is expected to launch in the second half of 2008 on a range of Nokia devices in selected markets.” Where, whom and at what price is still unknown. Interesting. Do we know if the songs from the Sony store will be DRM’d? If so, can the songs be transferred to a new handset? Getting a new phone every year isn’t too bad if the contract allows and you can move your music from the old to the new. Also, will the bandwidth allowance for the contract not include downloads from the Sony store?